KEVIN PHILLIPS, a keen analyst of American politics, is also a historical sociologist in the best sense of the term. The ways in which our society is both constituted and divided, not only in the present but as a consequence of history, have long been his concern. Early in his career, this steered him toward the changing composition of the electorate, and thus toward those elections that reveal significant shifts in the demographic alignments that drive American politics. His insightful debut, The Emerging Republican Majority (1969), analyzed the conservative realignment that increasingly drove Republican politics from the Nixon era to Bush the Younger in just those terms. Whether that era is now ending has become the burning question of the past few weeks—and one might hope that Phillips will return to this subject in his next book. In 1775, however, Phillips deals with political loyalties more fundamental than the mere matter of party allegiance. His broader purpose is to write a sketch of American nationalism at the revolutionary moment when that concept first cohered. That nationalism is not predicated on the egalitarian ideals of 1776, eternally expressed in the Declaration of Independence: 1775 is manifestly an anti-1776 book. The essential argument of Phillips’s book is that most of the developments that really mattered had already taken place, and that a fixation on Jefferson’s airy platitudes will prevent us from grasping how much had already been accomplished. The more authority we ascribe to the Declaration, Phillips posits, the more difficult it becomes to understand the broader array of factors that united some Americans and divided them from others. But this insistence on the primacy of 1775 as “the pivotal year” creates more problems than it solves. Casual readers might assume that a book with this title would provide a coherent narrative of what happened in 1775. Such an account might begin with the colonists wondering how the British government was going to respond to the decisions of the First Continental Congress, which met in Philadelphia from early September to late October in 1774 and set the basic premises of American resistance. Such a book would then erupt into dramatic conflict with the skirmishes at Lexington and Concord in mid-April 1775, and perhaps close with Tom Paine drafting Common Sense, which, when it was published on January 9, 1776, finally made independence a subject for open debate. Such an account would also have to spend some time in London, explaining the imperial government’s ill-calculated decision in 1774 to punish and attempt to isolate Massachusetts after the Boston Tea Party, and then its willingness to double-down after war broke out in the spring of 1775. But Phillips has no desire to write that kind of straightforward narrative. Nor does Phillips ever make clear why 1775 was uniquely important, or more important than 1776. Indeed, the assumption underlying the whole book seems somewhat contrived. Historians do not sit around weighing the importance of one year against another, or arguing, as Phillips several times suggests, that 1776 has been wrongly valorized to the detriment of 1775. Our task is to explain why events happened as they did. While chronology is always important, there is no explanatory magic to the calendar. The whole notion becomes more awkward as the book unfolds, not least because Phillips’s working definition of 1775 proves highly elastic. He prefers the idea of a “long 1775,” in the same way that historians write of a long eighteenth century (ending with Napoleon’s defeat at Waterloo) or a long nineteenth century (ending with the guns of August 1914). The long 1775, Phillips concedes, could go as far back as the fall of 1774, when the Continental Congress set the political ultimata from which it never retreated; and it could extend as far as mid-May 1776, when the Second Congress authorized the creation of republican governments across the colonies (thereby calling for an end to royal rule). But if you extend the dates thus far, there is really no reason not to go back, say, to the winter months of 1774, when the British government fatally decided to crack down on Massachusetts after the Boston Tea Party. 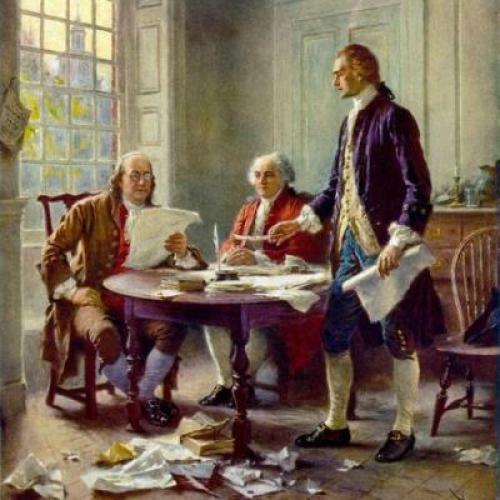 And why not extend the story to early July 1776, when Congress, reacting to resolutions passed by communities across the colonies, had to decide whether the moment for national independence had finally arrived? But this kind of stretching would commit Phillips to exactly the kind of political story he does not want to tell. He wants to focus on what might be called the structure of the conflict rather than its chronology. He spends the opening two-fifths of his 550-page book exploring the array of social facts and factors that determined the complexity of American politics in the late eighteenth century. Events, as we ordinarily describe them, do not happen here. Instead Phillips sets out to explain how religious, ethnic, geographic, and class-based identities would affect the loyalties of different groups. In this vein, most of the book, after its long-winded introductory chapters, is devoted largely to explaining how armed conflict escalated after April 1775. Phillips has read pretty deeply in the scholarly literature, and while he has not worked extensively in the vast corpus of primary sources, he conveys a vivid sense of how the conflict developed. He has great insight, for example, into the workings of the safety and inspection committees that made the Association—the framework for commercial resistance created by the First Congress—function smoothly. There is a solid chapter on the doomed American efforts to knock Canada out of the war, others that deal with the volatile situation of the southern colonies, and a keen appreciation of the enormous logistical challenges that both sides faced, as well as the manpower shortage that required the British government to recruit mercenary soldiers from various German states. If these chapters do not justify the broader claim that 1775 has been undeservedly neglected—a claim that any of a number of historians would dismiss—they certainly allow readers to see how independence rested on foundations deeper than Paine’s brilliant rhetoric and Jefferson’s grand propositions. Underlying Phillips’s emphasis on the structure of the conflict is a deeper skepticism toward the narrative that has dominated historical interpretations of the Revolution for the past half century. That narrative was framed by the two dominant historians of early America: Edmund Morgan in The Stamp Act Crisis (1953) and Bernard Bailyn in The Ideological Origins of the American Revolution (1967). Their analyses placed the central constitutional arguments over the sovereign jurisdiction of Parliament and the self-governing autonomy of the colonies at the very heart of the conflict. But the revolution, Phillips argues, was about much more than constitutional ideas and conflicts. He dutifully devotes a chapter to “The Ideologies of Revolution,” but his heart is not in it. He concedes the general importance of these ideas, but he remains skeptical about how much they can really explain. Many historians—Progressive historians such as Carl Becker and Arthur Schlesinger, neo-Progressives such as Merrill Jensen and his students, and neo-neo-Progressives such as Woody Holton—share this skepticism, so this is a defensible position. Still, one can doubt whether Phillips provides an adequate or persuasive alternate explanation of why the Revolution occurred. The implicit logic of his analysis is to suggest that the Revolution took place because the social, cultural, and economic factors he surveys somehow converged in the mid-1770s to make Americans into revolutionaries. But in nearly six hundred pages Phillips never offers an overt explanation of what the revolutionary dispute with Britain was finally about. The reasons why a crisis erupted in 1774 and spun out of control in 1775 are essentially neglected. The central cause of the revolution—and I use the term “cause” forthrightly here—was the existence of two rival views of the authority of Parliament over colonial affairs. From the perspective of the British “political nation,” Parliament possessed the authority to regulate colonial affairs “in all cases whatsoever”—a claim first asserted as a theoretical statement in the Declaratory Act of 1766, and then acted upon with the Coercive or Intolerable Acts of 1774. From the vantage point of dominant interests in every colony, this claim could not surmount the American insistence that the colonists could be governed only by laws framed by their own representative assemblies—with an exception perhaps being made for the Navigation Acts, which loosely regulated imperial commerce. These claims were equally well grounded in the norms, traditions, and practices of both countries, and both were wholly persuasive to the dominant interests in their societies. Once the First Continental Congress defined the American position in 1774, and Britain doubled down on its position in the winter of 1775, revolution was inevitable. How different groups of Americans got caught up in the resulting crisis, and what they individually hoped to accomplish through revolution, is thus a different question from the one that Phillips pursues. The revolution did not happen as the multiplicand of all the factors that fascinate Phillips, nor did Americans ever aggravate their local concerns into a compound platform of grievances that collectively justified independence. With his keen eye for the structure of society and politics, Phillips has a lot to say about the multiple concerns that were at play in late-eighteenth-century America. But these concerns, taken individually or collectively, cannot explain why the Revolution was destined to occur—in 1774, 1775, or 1776. Jack Rakove is completing a book on A Politician Thinking: The Creative Mind of James Madison.